In 2011, Alto Professional launched the Truesonic 1 series, which achieved wide acceptance around the world—from houses of worship to mobile entertainers to backyard patios. In the process, we established a new benchmark for loudspeakers. With the TS2 series, we set that standard even higher. This series consists of three models: the TS210, TS212 and TS215. We maintained the previous features that made them popular, but made them all significantly louder. Regardless of size, each model is 1100 watts peak, 550 watts continuous to have the power to fill larger rooms and maintain clarity without distortion. The TS2 series has a more professional appearance. The trapezoidal frame, durable polypropylene cabinet, and perforated steel grille provide a quality of form to suit any venue and match the excellent acoustics you're already accustomed to. We made them easier to transport. The TS210 is four pounds lighter than its predecessor with two integrated handles, so it's comfortable to pick up and carry in any orientation. It also employs professional-grade M10 rigging/suspension points to securely install it wherever it would sound best. Finally, our ground-up designed incorporates advanced amplifiers with superior heat-dissipation characteristics, eliminating the need for costly, noisy cooling fans. The result is a powered speaker system that runs cleaner, quieter, and has greater long-term reliability. 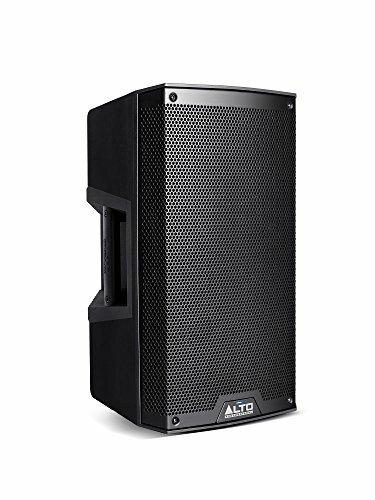 The Alto Professional TS210 is more powerful and better-looking, with greater portability and superior engineering—all without a jump in price. How loud can it get? How much power does it have? The TS210 loudspeaker comes with a 10" woofer with a 2" voice coil and a 1" neodymium compression driver. It can pump out audio at 1100 watts of peak power (700W LF + 400W HF) and 550 watts of continuous RMS power (350W LF + 200W HF). Why doesn't the TS210 have a built-in fan? Won't it overheat? All of the speakers in the Alto TS2 series are passively cooled, so no fan is required. This results in a quieter and more efficient speaker. You never have to worry about the TS210 overheating. Where do I set the volume control knobs on my TS210? This depends on a number of factors, including what you have connected to the speaker and the various levels you have already set on your other equipment. You can find a great guide about Gain Staging here http://www.noterepeat.com/products/alto-professional/pa-speakers/truesonic-series/436-alto-professional-truesonic-series-hardware-setup. This guide provides an overview of how to gain stage all of your equipment that connects to your Alto speakers to help ensure the clearest, loudest sound possible! What is the XLR Mix Out for? Use a standard XLR cable to connect the Mix Out to another loudspeaker. The signal sent from this output is a summed Mono signal of the two inputs. Can I bring the TS210 to a different country? We do not recommend using a TS210 outside of the country where it was purchased unless an authorized service technician has approved it.. For the TS210 to safely be used, an internal jumper needs to be changed, and the fuse needs to be replaced. This requires a service technician. For more information on service centers who may be qualified to perform this procedure, please contact Alto Technical Support.